Travel theme: Relaxing | Where's my backpack? I have been caught up in a flurry of activity recently and a little bit of time off is long overdue. Much as I wish some rest and relaxation were on the cards for the near future, I suspect it will be quite some time before I can put my feet up and take a break. In the meantime, I am stealing moments in between the frenzy to breathe and still my mind by relaxing vicariously through my photos. 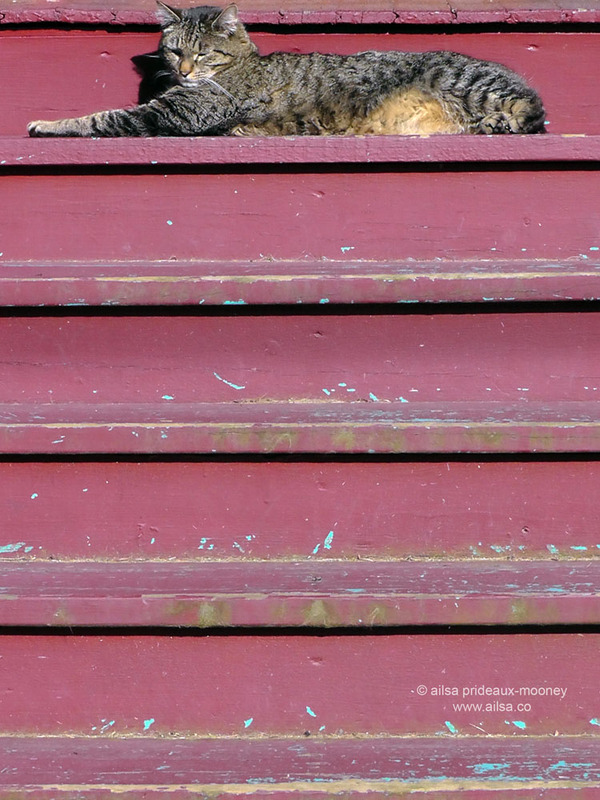 I spotted this cat luxuriating on a porch in Seattle not too long ago. On my way to the Skagit Valley Tulip Festival earlier this year, I did a double take when passing some horses snoozing happily in a nearby meadow. 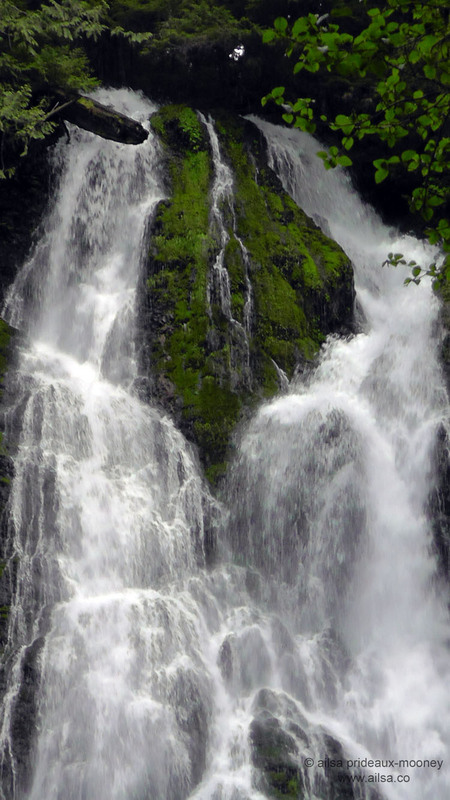 One of the things I find most relaxing is the sound of water – and waterfalls in particular. Here is one of my favourites – a rather splendid and surprisingly unnamed waterfall along the Boulder River Trail in the North Cascades. This entry was posted in Photography, Travel, Weekly Travel Themes and tagged humor, inspiration, nature, photography, photos, pictures, postaday, travel, writing. Bookmark the permalink. That’s a fantastic shot of the cat on the steps! Thanks Trish, he looked so perfectly idle. I also love the blue paint showing through underneath the pink/purple – it brings out some smoky blue in the cat’s fur. I’m first!……and I don’t know what to say, I’m so relaxed! Oh yes, pommepal, we could learn an awful lot from our feline companions about the art of taking it easy! Love all the shots.beautiful entries !!!! I don’t know that I’ve ever seen horses actually laying down in person, despite working on an island where they are the major transportation source. Still, your first one is a great capture. I immediately thought of this old one I had of a hilarious squirrel. Bad quality, but funny. Must have been a warm day just right for relaxing for the horses. Rare catch. I like the horses sleeping pic the best! That cat has nothing to do! Must be nice. 😉 Super shots. Hoping to be back with one f two myself. Thanks for hosting, Ailsa. 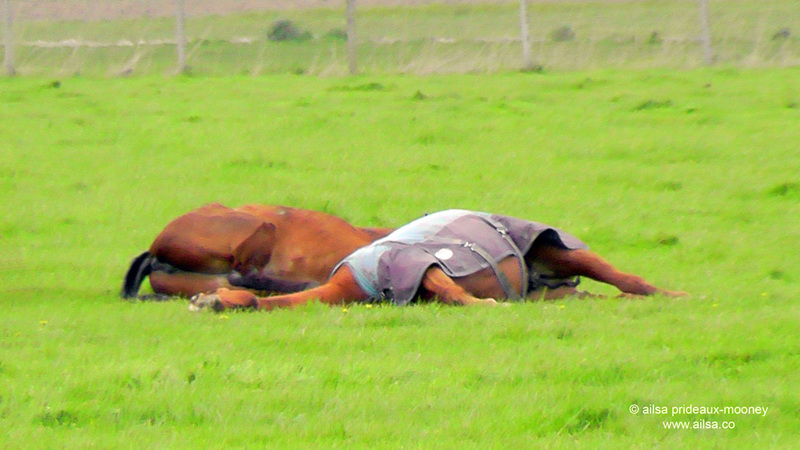 I’d always heard horses sleep standing up, so I’d be shocked to come across one lying down; I might assume it was dead! Mine also features an animal, or rather a facsimile of one. . .
Pingback: Travel theme: Relaxing | So where's the snow? I just loved the horses relaxing.On a recent walk in the mountains, there were loads of cows. All just down from the upper alms, and they were all relaxing in the sun, it won’t be long before they go into the barns for the winter. Check out the pictures of those who had over indulged! A relaxing post for a relaxing weekend! That cat! I want to curl up next to her and snooze 😀 Such a nice challenge, thanks, Ailsa. The waterfall is absolutely gorgeous!